製作人選擇 "And So It Goes"
自選 "Don't Let the Sun Go Down on Me"
^ Archuleta, David. The Official Website of David Archuleta. KidActors. 2003–2005 [2008-02-28]. （原始内容存档于2005-06-03）. ^ Deseret News "Friends knew Archuleta had talent"
^ Murray High teen moving up on 'Idol'. Associated Press (Deseret News). 2008-02-15. ^ Introducing David Archuleta. American Idol. February 18, 2008 [2008-03-06]. ^ Star Search: Episode 03, 01/31/2004, Story. CBS. （原始内容存档于2009-01-26）. ^ Star Search: Episode 04, 02/07/2004, Story. CBS. （原始内容存档于2008-09-05）. ^ Star Search: Episode 05, 02/14/2004, Story. CBS. （原始内容存档于2008-08-20）. ^ 8.0 8.1 Star Search: Episode 06, 02/21/2004, Story. CBS. （原始内容存档于2009-01-26）. ^ Star Search: Episode 07, 02/28/2004, Story. CBS. （原始内容存档于2009-01-22）. ^ Star Search: Junior Singer Video. CBS. （原始内容存档于2008-12-03）. ^ John Farnham released the track in 1985; it was re-arranged and released as a cover version by David Foster with vocalist Jeff Pescetto in 1990, the year Archuleta was born, hence being able to choose it. ^ Rocchio, Christopher. Fox reveals 'American Idol' Top 20 songwriting competition songs. Reality TV World. 2008-04-14 [2008-05-20]. ^ Hasty, Katie. 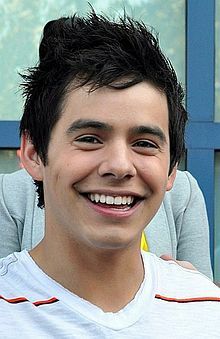 David Archuleta Signs With 19 Recordings. Billboard. June 5, 2008 [2008-08-14]. ^ Pietroluongo, Silvio. David Cook Sizzles With Record Chart Debuts. Billboard. ^ Week 6 (July 16 2008). So You Think You Can Dance (U.S. TV series). 第4季. 第13集. 2008-07-17. ^ Slezak, Michael. "David Archuleta's 'Crush' is surprisingly good!". Entertainment Weekly. August 8, 2008 [2008-08-12]. ^ 21.0 21.1 TC08 Rocked The House. 青少年选择奖. 第10季. 第1集. 2008-08-03. "A Moment Like This（英语：A Moment Like This）"
"Flying Without Wings（英语：Flying Without Wings）"
"I Believe（英语：I Believe (Fantasia song)）"
"Inside Your Heaven（英语：Inside Your Heaven）"
"Do I Make You Proud（英语：Do I Make You Proud）"
"This Is My Now（英语：This Is My Now）"
"The Time of My Life（英语：The Time of My Life (David Cook song)）"
"I Am Beautiful（英语：I Am Beautiful）"
"As Long as You Love Me（英语：As Long as You Love Me (Caleb Johnson song)）"
"Beautiful Life（英语：Beautiful Life (Nick Fradiani song)）"